When our community comes together for a day of giving, we see great displays of generosity that help our local nonprofits provide needed services and improve our great city. The next Give to Lincoln Day will be May 31, 2018. All gifts given for the event will be matched by our $400,000 challenge match fund, the largest ever for this event. 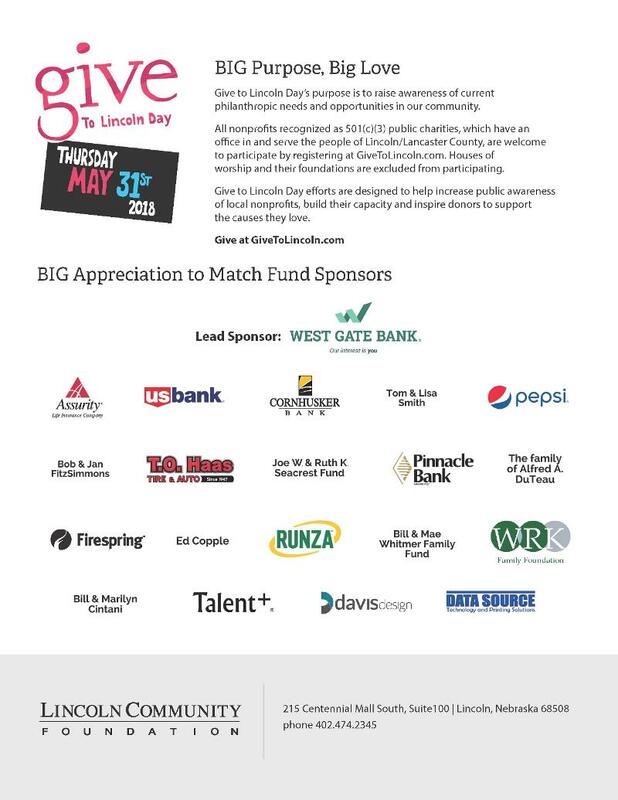 Lincoln Community Foundation and generous sponsors helped make this match fund possible. See a list of these generous sponsors, and more information about the event at www.givetolincoln.com. Since the first Give to Lincoln Day in 2012, thousands of donors have come together to raise more than $16 million to support Lancaster County nonprofits. The 6th annual Give to Lincoln Day was May 18, 2017. Our community raised a record $3,693,307, which is almost $430,000 more than the previous record set in 2015.